For [Kerry Conran, creator of Sky Captain], the question, as he put it, was ”Could you be ambitious and make a film of some scope without ever leaving your room?” And so 10 years ago, Kerry Conran went into a room in his apartment to make a movie. In some ways, he is just now beginning to come out of it. At first, he was a mystery. Word of ”Sky Captain” began to spread around the Internet only after Conran finished primary shooting in London last spring — extraordinarily late for the Internet, which often seems invented specifically to track movies with giant robots in them. Even then, no one knew who Kerry Conran was. Google couldn’t touch him. He was so undocumented in the world of Hollywood that I briefly wondered, when I began pursuing him, if perhaps he was just a front for his producer and partner and mentor Jon Avnet, who is well known for producing ”Risky Business” and directing ”Fried Green Tomatoes” but who is not so well known for retro-science-fiction summertime blockbusters, and who unlike Conran seems to have been photographed at least once in his life. I don’t think Conran would mind that I doubted his existence. In fact, for a long time, that was the plan. Conran created the entire universe of the movie using computers. I mean, I guess it’s not that rare in the age of Pixar, but the live actors involved (including Gwyneth, Jude, and Angelina) worked in front of blue screens the entire time. That seems big, somehow. They can do anything here. 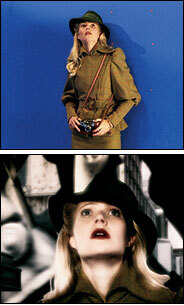 When one of Paltrow’s arms was cut out from a shot, they copied the other one, flipped it and pasted it back in. Since all the lighting was being done on the computer, they could paint the frame with light and noirish shadows, erase it all and then start again. Watching the Sundancers cultivate cell-phone tumors induced a certain empathy. I felt for these people. And that feeling fueled my fantasy of the Garage Kubrick. Who is maybe 14, 15 at most, and is either the last or the very first auteur -- depending on how you look at it. The Garage Kubrick hates everything that Sundance, let alone Hollywood, puts people through, and he won't have Slamdance or Slumdance either, or any of the rest of it. The Garage Kubrick is a stone auteur, an adolescent near-future Orson Welles, plugged into some unthinkable (but affordable) node of consumer tech in his parents' garage. The Garage Kubrick is single-handedly making a feature in there, some sort of apparently live-action epic that may or may not involve motion capture. That may or may not involve human actors, but which will seem to. The Garage Kubrick is a control freak to an extent impossible any further back along the technological timeline. He is making, literally, a one-man movie; he is his film's author to the degree that I had always assumed any auteur would want to be. And he will not, consequently, come out of the garage. His parents, worried at first, have gone into denial. He is simply in there, making his film. Doing it the way my friend assumed Stanley Kubrick would have done it if he'd had the tech wherewithal. Looks like the GK is here! Except a little older. And somehow I don't think that Gibson was imagining that Gwyneth Paltrow would play any part in this. I tried to be a Garage Kubrick one summer in college, but I ended up reading a bunch of books instead. Okay, except clearly Sky Captain is not being made in anyone's garage or basement, either. But still, you get the idea. I just watched the trailer again and realized they got someone other than Generic Movie Trailer Voice-Over Man to do the voice-over. Nice. Okay, I'll stop commenting now. Sky Captain looks really good. It's Iron Giant-style in live action. I'm really looking forward to it. Not for 3 months though.